This level has easy difficulty and you need to use simple strategy to complete this level. 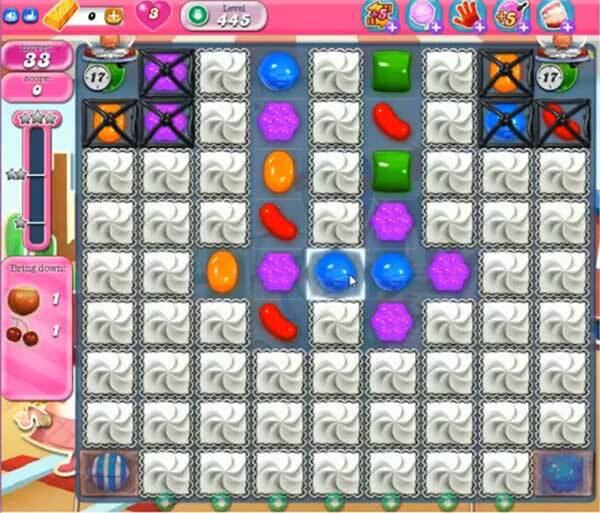 For this level you should try to break the grills and blockers using wrapped candy with striped candy combo or colorbomb with striped candy combo if you get chance. Try to play more from bottom to get more chance to make special candy. After play near to ingredient to take them to the bottom easily. This is a ridiculous level. The apple and the cherry do not even come down until the game is half to 3/4 over despite anything I do. You can make the levels hard but don’t make them ridiculous. On another note, you’re stopping of taking debit cards as payment was another ridiculous move. Debit cards work just the same as credit cards. If there is not enough money on the card it doesn’t go through. You have nothing to lose but the money of your players. Sometimes I wonder why I continue to play.